Hubby and I recently returned from a Disney cruise to the Bahamas on the Disney Dream ship. It was a 3-day cruise from Port Canaveral, Florida. We went with our good friends Cori and Terry — and their 5-year-old son, Cam. Before you leave home, you can schedule a Disney character to call your family on the telephone… it’s FREE! This pre-recorded phone call from select Disney characters will wish you well and encourage you to have a fun time on your cruise vacation. You can start your online check-in 75 days before the cruise. BONUS TIP: If there’s an activity that you’re really looking forward to, you should do the online check-in as early as possible — because some activities sell out! Even though you have to select a specific boarding time (a 30-minute time slot beginning at 12 noon on the day of departure), you can get there early and board anyway… just not before 12 noon. We had a 2:30 p.m. boarding time, but we arrived around 1:45 p.m. and they let us board without any questions. I’ve verified that the Disney cruise line will always let you board earlier than your assigned time. BONUS TIP: On our drive to Port Canaveral, we thought we’d get something to eat at the last exit before the terminal — but there weren’t any restaurants near there. So we were thrilled to learn that the buffet on the ship is open until 3 p.m. even on the first day. The buffet at Cabanas restaurant made a great first impression, too… because all of the food was delicious! You can make reservations with Park N’ Cruise to park your car for $11 a day ($33 total) instead of the $68 total (which amounts to about $23 a day) to park in the terminal itself — which, of course, is super convenient. We paid the extra money to park close. NOTE: At the parking area is where they take your bags. Your luggage will show up in the hallway in front of your room by the time the ship sails. As soon as we got to our rooms on the ship, we (and our friends) went into panic mode trying to figure out how we were going to charge our phones and electronic gadgets in what appeared to be foreign outlets (220-volt instead of 110-volt). We figured that we were all going to have to buy outlet adapters in the gift shop in order to use our electronics on the ship. After some trial and error, we learned that even though the outlets onboard the ship look unusual — they will charge standard U.S. electronics just fine! NOTE: The only catch to using the Disney Dream cruise ship’s outlets is you may be taking a chance with some electronics. Case in point: our friend’s headset stopped working after he charged it in the room — and it never worked again after leaving the ship. Also, powerful items (up to 2000W) can only be plugged into the outlets that are labeled for hairdryers and shavers — otherwise they won’t perform at full speed. We enjoyed watching our ship set sail for the ocean seas from the comfort of our balcony. First, we interacted with the seagulls while we watched another cruise ship set sail from Port Canaveral — moments before ours departed. Then, we spent about 30 minutes looking at all the jellyfish in the water (literally thousands of them) right below our balcony. We also saw some turtles, a large stingray, and even a dolphin right below us — near the ship’s hull! Of course, there is an official Sail Away Party on the Disney Dream cruise ship that takes place on the pool deck (Deck 11) — but it’s very crowded there. Our friends picked out a couple dozen photos at the end of the cruise, and they ended up paying a little bit more than they would have paid for ALL of the cruise photos (the “unlimited digital photos package”) had they prepaid before the cruise instead. 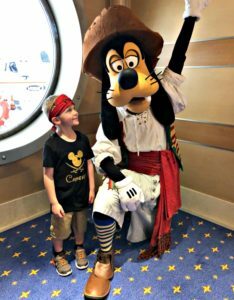 So… one of my best Disney Cruise tips is if you purchase the Cruise Photos package before the ship leaves port (up to 2 days before), you’ll save money! Yes, it’s hard to commit to spending a little over $200 on photos before you even set sail, but it really is the best deal. The Disney Cruise Line Navigator App is super handy… and it’s FREE! Any charges you’ve accrued — for the previous day’s excursions, alcoholic drinks, etc. 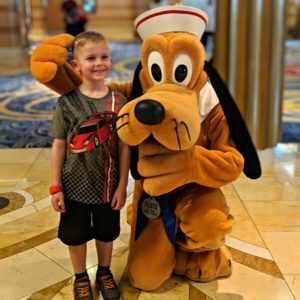 BONUS TIP: One of the best parts about the Disney Cruise app is the fact that you can send messages to others who are on the cruise via your smartphone without any international phone charges. Since your phone remains in Airplane mode at all times, no cellular roaming fees are accrued. It’s like texting on the ship… for FREE! Interestingly, your personalized Cruise Card is what activates the lights inside your stateroom! You have to slide it into a slot on the wall (by the door) and leave it there if you want the lights to stay on. Otherwise, they’ll turn off automatically in a matter of minutes after you remove your Cruise Card. BONUS TIP: Bring (or buy) a lanyard for your Disney Cruise Card. Many people buy one, but personally I would just bring one that I’ve received from a previous event or conference I’ve attended. If you do buy one, you might want to choose a waterproof pouch (or dry pouch) with lanyard that you can even wear it in the pool and during your excursions. I saw several people — adults and children alike — wearing theirs in the pool. The Disney Dream ship has an excellent buffet (that is only open for breakfast and lunch) called Cabanas. Inside the Cabanas boardwalk-style restaurant, there are at least 10 different food stations all in a row — and you can help yourself to as many different foods and as much as you’d like to eat. All of the food is really fresh… and tasty! The only bummer is the buffet closes at 3 p.m. every day. I wish it was open 24/7 — because sometimes you just want to grab some fruit or something quick before the show… or the late dinner. You always hear that you can eat at all hours of the day and night on a cruise because there’s food galore everywhere you look. 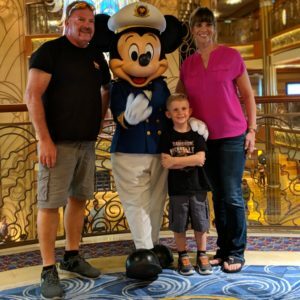 Not so on a Disney Dream cruise! While the pizza food station stays open until 12:30 at night, the only food that’s available 24/7 on Disney Dream is from room service. All of the other food stations and restaurants have very specific hours of operation. There was a lot of talk among our group about the eggs on the Disney Dream. They were so runny that we didn’t dare eat them. As it turns out, many people like the eggs on a Disney cruise. There are no formal dinners (or formal evening events) on the Disney Dream cruise ship — and therefore, no special dining attire required except for in the adults-only restaurants. Personally, I like dressing “cruise casual” for the entire duration of the trip — so I didn’t miss the formal nights at all. The only time we wore something “special” was on theme night — which was Pirate Night. 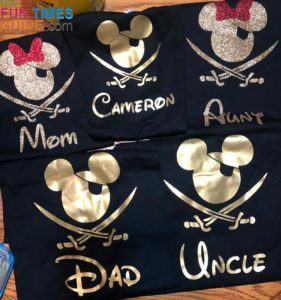 Our friends even bought personalized Disney pirate shirts on Etsy for us all. They were perfect since 5-year-old Cam loves to wear “matching outfits”. BONUS TIP: Dinner is one time that it makes sense to arrive fashionably late! There is absolutely no need to rush to dinner — because you’ll just be waiting in a long line with a lot of impatient children. But if you show up just 5 minutes after they’ve started seating everyone, you’ll be able to walk right in. At your assigned dinner each night, you will always have the same server (person who takes your food orders, addresses special requests, and cuts your child’s food) and assistant server (person who takes your drink orders and delivers the food to your table). They both try hard to get to know you and what you like. 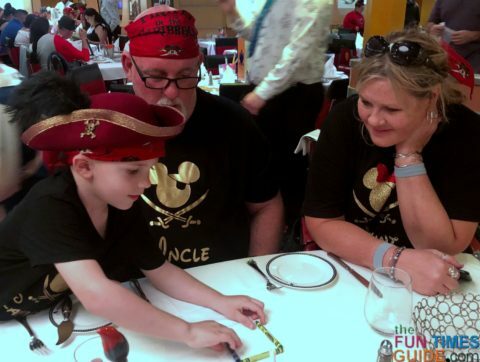 Like most of the servers on Disney Dream, ours performed several different mind-boggling magic tricks at the table each night that amazed us all — adults and children alike. BONUS TIP: Our friend is a meat and potatoes guy, so he wasn’t into all the fancy dinner options each night. Instead… he would order 2 of whatever steak item was on the menu, along with a caesar salad (even though that type of salad wasn’t on the menu) and no side dishes. The chef and your server are always more than happy to give you whatever you want! Hubby and I also enjoyed one of the appetizers so much that we ordered a second helping of it — at the last minute. They happily brought us each another serving! Complimentary room service is included for the duration of your cruise. The room service food is FREE — but soda pop, bottled water, and snacks are an additional fee. BONUS TIP: I’ve heard from many people that you can get Mickey bars (Mickey Mouse head shaped ice cream bars) and Smuckers Uncrustables (packaged peanut butter & jelly sandwiches) from room service — even though they’re not on the menu. You can also specifically request other items from room service that are not on the menu, as long as they are relatively basic food items. Designed for families, the rooms on a Disney Dream cruise have about 25% more space than typical staterooms. They’re well-designed rooms, too — with plenty of storage space. There’s even a wide open space underneath the bed to keep your luggage and other large items completely out of the way! 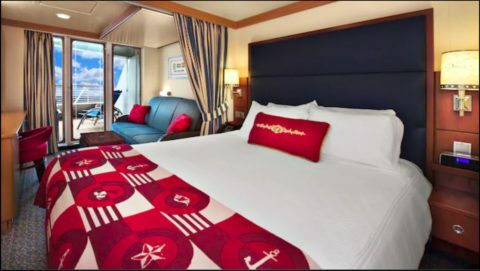 BONUS TIP: You can read reviews of Disney Dream staterooms to see what other cruise guests have to say about the exact room you’re staying in! We were in stateroom #5034 and our friends were in #5036 — so we had adjoining rooms and could open a door in between the 2 rooms to visit with one another. BONUS TIP: We had what’s called a whitewall veranda. While there is a divider separating the 2 adjoining rooms’ balconies, it’s easy to use a car key to “unlock” and slide the white wall divider out of the way — giving you one extra-large balcony space to share together. Ideally, you want your room to be as close to midship and as near the water line as possible — for the smoothest (and quietest) ride. Our stateroom was a little more forward than midship. (That’s where the largest balconies are located on the Disney Dream cruise ship.) Even though we were a little farther away from the pool area and the food, we were closer to the dining rooms and activities — so for us it was a great choice. 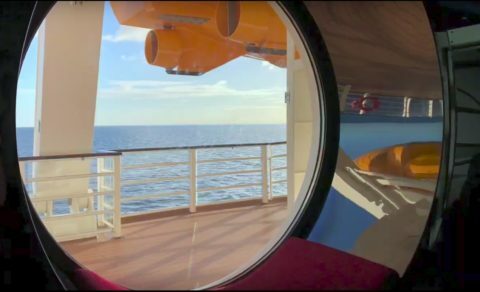 NOTE: If we follow through with our plans to sail on a Disney Dream cruise again, we will probably get a 5th floor room again with a balcony / veranda — as close to midship as possible. The staterooms are cleaned twice each day — which is actually quite nice, because it’s refreshing to always come back to a clean room. As a result, you will probably cross paths with your stateroom host (aka housekeeping attendant) at least once each day — because they are almost always busy cleaning the 11 other rooms next to you. NOTE: Interestingly, your stateroom host actually knows which activities are on your personal schedule for the day. Ours always asked how we liked XYZ, or how the show was, or whatever else we had just attended. I guess they are made aware of the guests’ schedules so that they can better time the cleaning of the 12 rooms they’re assigned to. The bed and pillows on the Disney Dream cruise ship are super comfortable! I never had a difficult time falling asleep. Cam slept on the sofa that pulls pulls out into a bed. On the last night, the housekeeping attendant changed his sheets and pillowcase to a dinosaur theme. He loved it! BONUS TIP: If you need to use the pull-out sofa bed and it feels too hard for your liking, you can request an egg crate mattress topper from your stateroom host. Having been on 2 other cruises before (both of which had very rough seas and lots of people got sick), we came prepared for seasickness. Neither of us got sick on this cruise. We started the cruise by taking 2 tablets of Dramamine right after we got on the ship (which was about and hour before we set sail) — never took anymore Dramamine. Hubby has the weakest stomach and has always had good luck wearing the Seaband wristbands for motion sickness. I bought a pair for each of us at Walmart (1 gray pair, and 1 black pair). I also bought some anti-nausea gum by the same manufacturer (Sea-Band), but never even opened the pack. BONUS TIP: While we’re talking about medications, I recommend bringing common over-the-counter medicines with you (like nighttime cold medicine, Ibuprofen, Tylenol, Imodium, and allergy meds) — because if you go to the ship’s doctor and they think you are sick, they might quarantine you! 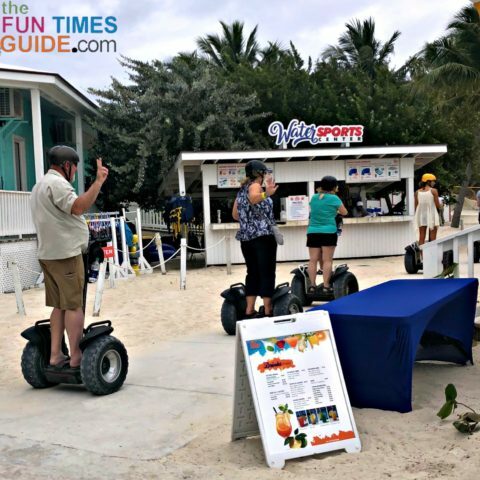 Hubby and I chose the Segway and Beach Safari excursion on Blue Lagoon island. 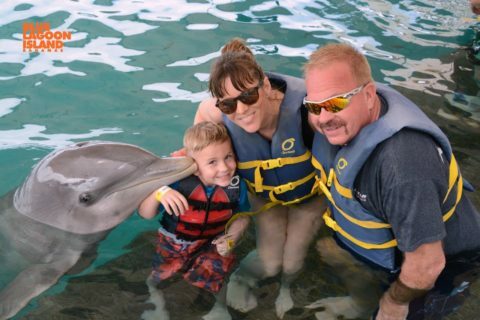 Cori, Terry, and 5-year-old Cam chose the Dolphin Encounter on Blue Lagoon island. NOTE: Both of our excursions included 1 FREE digital photo of your party participating in the adventure. (The photo is emailed to you.) At the Dolphin Encounter, you can also buy additional photos if you want to. 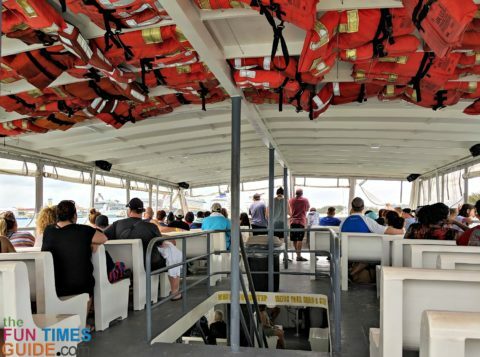 Interestingly, people from other cruise ships (that are docked in the Bahamas at the same time as the Disney Dream cruise ship) are also on the ferry ride and the excursions that take place on Blue Lagoon island with you. My husband and I both splurged and took advantage of some Spa treatments. I got a pedicure (which lasted about 1 hour and included a soothing eye gel application and some cool-feeling Arnica gel on my shoulders) and a 50-minute massage (which included extra attention in the specific areas I asked the masseuse to focus on: lower back/sciatica, shoulders, and neck). My husband got a facial and a shave. He was a little bummed that they didn’t shave his entire head (he’s a bald guy with a goatee), but I think they would have if he had specifically asked them to. The Spa attendants are hopeful that you’ll buy products while you’re there (the very high-quality ELEMIS brand). Hubby actually bought what they recommended on the spot, and I ended up buying what they recommended from Amazon after we got home. For me, it was ELEMIS Salt Scrub (for exfoliating the dry, cracked skin on my feet) and ELEMIS Body Oil (to lock in moisture on my feet after exfoliating) — at my pedicure. Plus, ELEMIS Musclease Bath Soak (to soothe the tense muscles in my back) and ELEMIS Muscle Reviving Body Gel (to relax my neck, back, and shoulder muscles after a shower or bath) — at my massage. 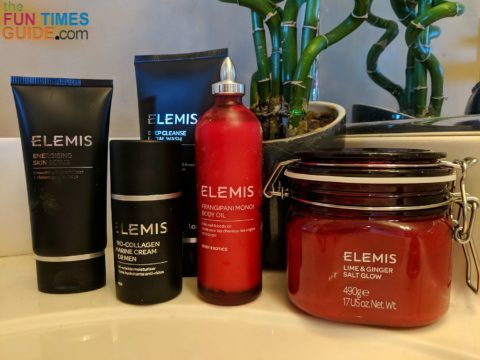 For my husband who has sensitive skin, it was ELEMIS Energizing Skin Scrub for men (a smoothing exfoliator for the face with microbeads), ELEMIS Deep Cleanse Facial Wash for men (a gentle face cleanser), and ELEMIS Pro-Collagen Marine Cream (an anti-wrinkle moisturizer for men). And… even though they are trying to sell you a product that will help with your particular skin issue, I actually do agree with the following quote, because the Spa staff was prompt to put the products away after I said, “No, I’m not interested.” They never asked twice, and they didn’t frown or roll their eyes. They are very understanding when you respectfully decline the products. Even though Disney’s Castaway Cay has been voted best cruise line private island for 3 years in a row, we skipped Disney’s island experience altogether. BONUS TIP: Unless there is something specific that you look forward to doing on Castaway Cay (like participating in the 5K, snorkeling around Mickey’s sunken treasure, or sinking your toes in the sand at the beach)… if you want to avoid the crowds and have a relatively quiet day on the ship, I highly recommend staying on the boat that day! Of course, there are lots of other fun activities on Castaway Cay that you can also enjoy — for a fee. Anyone with a child will tell you… Take the time to have pictures taken with as many Disney characters as possible! Sometimes, the lines for Character Greetings may seem long — but they actually move rather quickly and there are usually other things to watch nearby while you’re waiting. 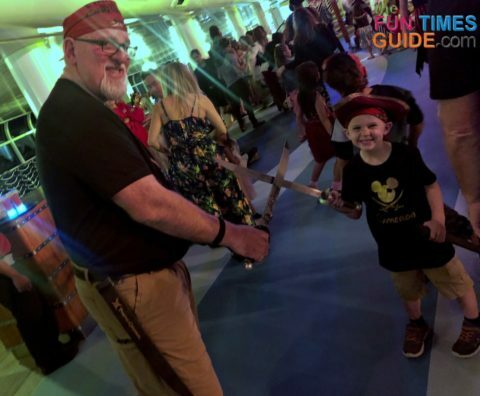 BONUS TIP: In addition to having photos taken with the Disney characters onboard the ship, there are lots of other ways to interact with the characters. These meet-and-greet opportunities are called Character Experiences on the Disney Dream cruise. This is a really cool interactive adventure for kids of all ages! There are 3 different versions of the Midship Detective Agency Game that you can play. (Many play a different version each day that they’re on the ship.) If you wanted to play each one quickly, you could probably finish each detective “case” in about 1 hour. When you find one, you hold up your personalized detective badge to activate a special effect in the LCD screen that magically brings the artwork to life! Follow Mickey Mouse or Donald Duck’s instructions to move your detective badge around in front of the screen, and you’ll unveil your next clue. 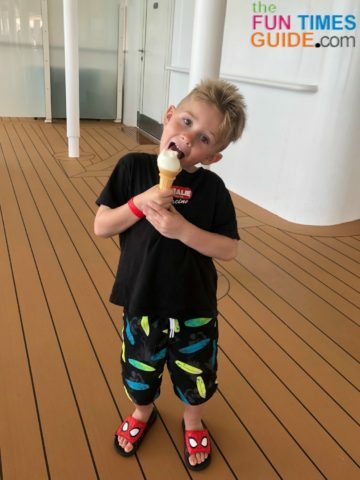 BONUS TIP: We didn’t start this game with 5-year-old Cam until the very last night of the cruise. It would be best if you start playing this game on the very first day of the cruise — that way, you will naturally become familiar with everything that’s on the ship while you’re searching for clues! There are no casinos on any Disney cruises, however there is Bingo! You don’t use Bingo markers (or Bingo daubers). 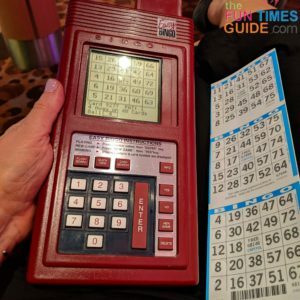 Instead, you simply flip over the cut-out tab for each number that’s called on your Bingo paper cards. Kids are allowed to play Bingo, as long as an adult accompanies them. Plus, the Bingo games go quickly enough — so any kids who are not playing don’t get too bored. NOTE: Several times, kids actually won the Bingo games. Their parents collected the prize money which ranged from $100 to $150, on average, per game (split if there was more than one winner). There are 2 large theaters with stadium seating (even balcony seating and side balconies — like in a classic theater) where Broadway plays take place on the stage and recent releases of Disney movies are shown on the big screen. We watched 1 movie in one theater and saw 2 plays in the other. BONUS TIP: To see what movies will be shown on your cruise before you get on the ship, call (888) 325-2500. The information is updated about 2 weeks before each Disney Dream cruise. For what it’s worth, people come and go a lot while the movie is playing. I think it’s because no one actually plans to spend their time watching a movie when they’re on a cruise. So watching a movie is often used as a way to pass the time until the start time approaches for something that you’d rather do. BONUS TIP: Food and soft drinks are NOT FREE at the snack stations located outside of the 2 theaters! Freshly popped popcorn, candy, and canned sodas are quite expensive there. I recommend filling your own water bottle with the beverage of your choice from the FREE Beverage Station on Deck 11 before you head to the theater to watch a movie or a play. Outside of each theater, they sell popcorn in refillable popcorn containers (for $7.50) — and you can refill them as much as you like during your cruise for just $1.50 each time. We thoroughly enjoyed the 2 live shows: Beauty and the Beast and Believe. This adaptation of Beauty and the Beast recently won an award for best live production on a cruise ship! 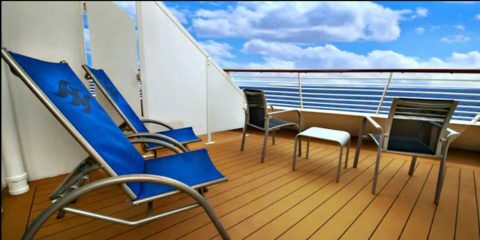 The pool deck on Deck 11 is the most popular spot on the Disney Dream cruise ship. There is 1 large swimming pool for adults-only near the bar called the Quiet Cove pool — and there is a hot tub for adults-only there as well. BONUS TIP: While children are not allowed to hang out in the adults-only areas, they are welcome to pass through those areas. In fact, to get to the main pool deck, you pretty much have to walk right through the adult pool area! 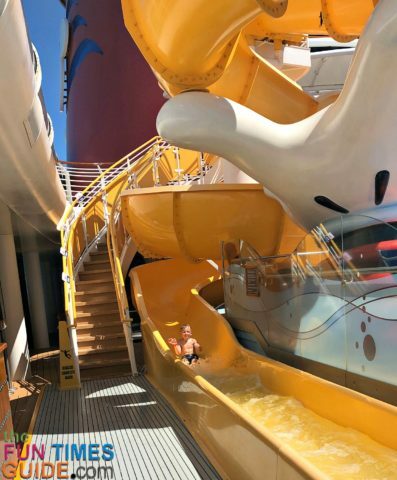 BONUS TIP: The water slides are super popular during the daytime hours, but not so much in the evenings — especially the 2-person AquaDuck slide that goes above the swimming pool area. (It’s a water coaster, similar to a log ride found at amusement parks, only you’re on an inflatable raft that holds 2 people and floats through a clear tube above the pool area.) The other waterslide at Mickey’s Pool is a child-sized slide with a few twisties. There’s a jumbo LED screen (24 feet wide and 14 feet high) located atop the ship’s Forward funnel — where Disney movies, popular TV shows, and major sporting & broadcast events are shown throughout the day on Deck 11. I must say, the sound quality is excellent. And there are plenty of poolside chairs to sit in — all with a great view of the screen. 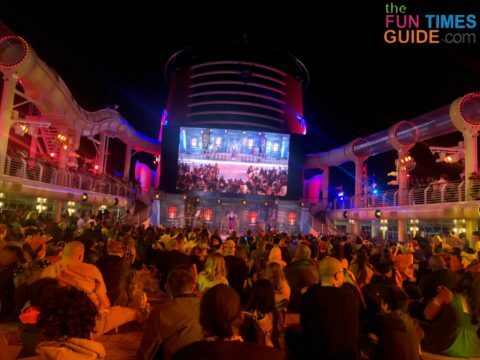 This jumbo screen also provides a close-up view of what’s happening on the small stage just beneath it — to accommodate the hundreds of cruise guests who attend parties on the pool deck. That way everyone can have a front row seat and see the action that’s taking place on the stage! BONUS TIP: There are very few clocks in plain site on the ship. Most people carry their phones and use that as a clock. I happened to notice that there are 2 small clocks on both sides of the jumbo screen on the upper pool deck railings. There is an all-you-care-to-eat Ice Cream Station that’s available 24/7 for FREE. There are several flavors of soft-serve ice cream and kid-sized cones to put it in. There’s also an all-you-care-to-drink Beverage Station that’s available 24/7 for FREE and includes milk, juice, hot tea, iced tea, coffee, hot chocolate, lemonade, and soda pop. This was a pleasant surprise to us — because most cruise lines don’t provide soft drinks for free. Each guest is allowed to bring 6 bottles of beer onto the cruise and 2 bottles of wine or champagne — in your carry-on, not in your checked luggage. Early dinner guests have to leave their room (and be inside the dining room, if you want to eat breakfast) by 6:45 a.m. on the last morning. Late dinner guests have to leave their room (and be inside the dining room, if you want to eat breakfast) by 8:00 a.m. on the last morning. On the final night of your cruise, you have to leave your luggage in the hallway in front of your door by 10:30 p.m. That’s when all of the stateroom hosts take it downstairs and into the port terminal for you to pick up when you pass through Customs on your way back to your car. 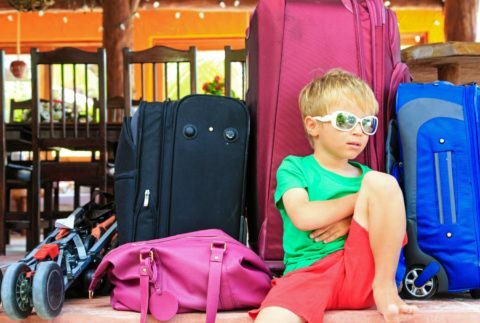 If you don’t leave your luggage out in the hall the night before, then you will have to lug it around with you through breakfast and during the waiting period until you’re allowed to get off the ship. BONUS TIP: Having your bags in the hall by 10:30 p.m. enables you to put the current day’s clothes into your suitcase and leave out whatever you plan to wear off the ship the next morning. You’ll want to have at least 1 carry-on bag with you on the final morning — for all of your toiletries and sleep clothes from the night before. Everywhere you look on board the Disney Dream cruise ship, you’ll find the nicest staff ever! NOTE: In case you’re wondering, here’s what it’s like to work on a Disney Cruise ship — with regard to pay and benefits. Every single receipt you sign for services while on the ship includes a 15% tip. Most people don’t realize this the first time they’re signing the receipt — like the very first day when servers are roaming the ship asking if you want to buy the Bottled Water Package. BONUS TIP: If you don’t want the additional Disney insulated cooler bag with your Bottled Water Package, then you must specify that — otherwise, they will assume you want it and you’ll pay dearly for it! Also, don’t feel bad crossing out the “additional tip” line on each receipt you sign. Disney makes sure that they automatically get 15% each time! 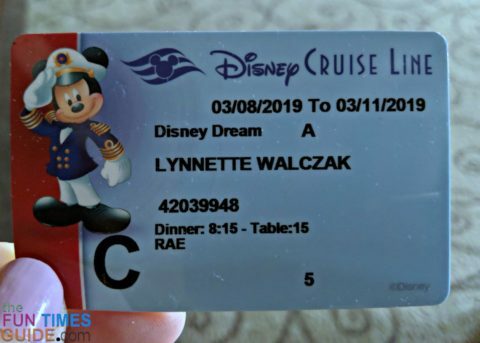 You’ll notice that Disney automatically includes a daily gratuity for the 4 crew members who personally assist you each and every day — it appears in your daily stateroom bill. If you would like to raise or lower any of the gratuity amounts, you can go to Guest Services anytime during your cruise and ask them to adjust the amounts. BONUS TIP: One way to increase the gratuity amount is to add cash inside the envelopes that you will find in your stateroom on the final night of your cruise. (Your stateroom host will place them there prior to dinner time.) That way, in addition to the slip of paper — stating that you agree with the gratuity amount that has been charged to your account for each crew member — you can add some more cash inside the envelope before handing it to the crew member whose name is on the outside. NOTE: Above, I explained the responsibilities of the dinner server and assistant server. However, the one person that you are also expected to tip (and that you are least likely to have come in contact with) is the head server. They’re the one in charge of your overall dinner experience, special dietary requests within your party, and any special occasions for the people at your table. We learned that you don’t actually need a passport for this cruise to the Bahamas. A birth certificate is enough because the Disney Dream cruise is a closed loop trip — which means you’re taking off from and returning to the exact same place in the U.S. NOTE: Here’s more about which documents are required. The quickest and easiest way to locate things on the boat is to use the lighted and framed map of the ship that is posted near each elevator throughout the ship. These are the typical “You are here” types of maps. They clearly identify everything that’s on that particular floor — in the forward, mid, and at areas of the ship. 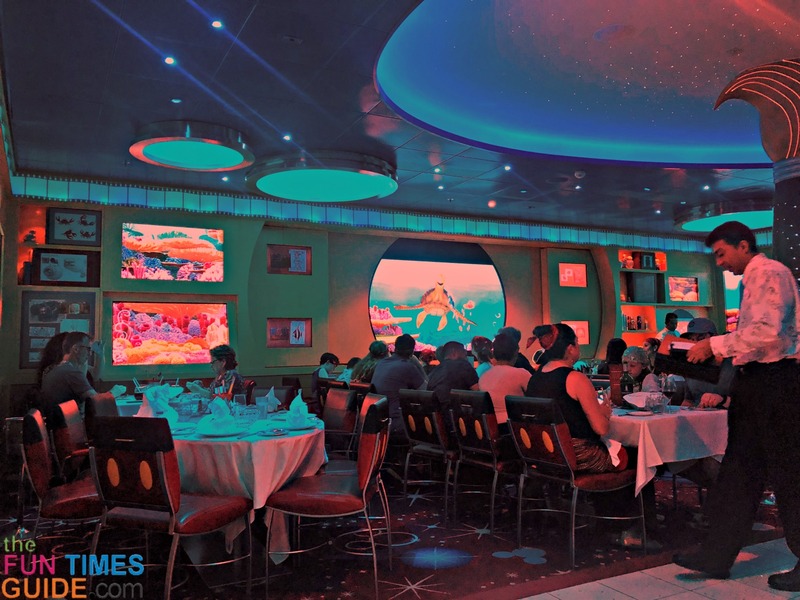 The staterooms on the port (left) side of the ship have fish sculptures as door markers, and those fish are swimming aft (toward the back of the ship). The staterooms on the starboard (right) side of the ship have seahorse sculptures as door markers, and they are also facing aft (toward the rear of the ship). There is so much on the ship that we never took the time to explore! As I’ve already stated, we didn’t leave the ship on the day that everyone else enjoyed Castaway Cay — Disney’s private island — for the reasons mentioned above. However, next time I think I might want to participate in the Castaway Cay 5K (walking, not running!) — just for the sense of accomplishing something meaningful on a cruise where typically all I do is eat and lounge around. (That and for the medal you receive!) As a non-runner, I definitely wouldn’t be alone walking the Castaway Cay 5K — many people admit that this is their first 5K. TIP: As long as you walk a little beforehand (so you’re comfortable walking long distances), it shouldn’t take much more than 1 hour to walk the Castaway Cay 5K. It’s FREE… and there’s no cut-off time, if it happens to take you longer! I think those are 2 awesome features that Disney provides its cruise guests. When we return next year (yes, all 5 of us have already agreed to make this an annual vacation), we plan to use them both. Specifically, Disney’s Oceaneer Club and Disney’s Oceaneer Lab are wonderful places for kids age 3-12 to spend time with others their own age — and a way for the adults to spend some time alone… or with others their own age. I’m told that there is, on average, 1 Oceaneer counselor for every 7 or 8 children. The couple that sat at our dinner table brought their 5-year-old grandson on the cruise with them. They (and he) couldn’t say enough good things about the Oceaneer Club and Oceaneer Lab! 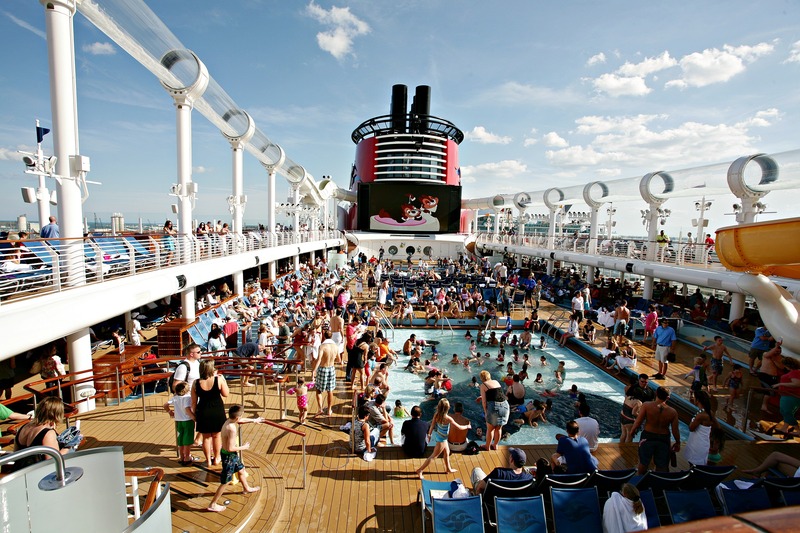 A must-read… the ultimate Disney Cruise Packing List! I especially like the tip for using sticky notes to leave messages on the mirror for the room steward (if you need something or want the beds made up differently). Here’s a list of the awards that Disney Cruise Line has received. A list of things that are FREE on a Disney Dream cruise. The best Disney Dream cruise secret: the Rainforest at the Spa! 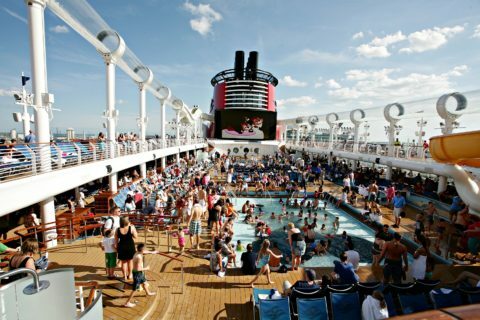 Here is what’s included in the Disney cruise fees.